I’m lying in bed right now in a mild amount of pain. You know how, in the hospital, they ask you to rate your pain on a scale of 1 to 10, ten being the worse ever? My pain at this moment is about a 2 or 3. It’s a dull ache in my back, right side. But, if I move the wrong way, that becomes a 9, easy. Yesterday, as I was about to leave for work in the morning, I did not realize that my lawn sprinklers, having been blown by the wind, had coated my driveway with a thin, imperceptable sheet of ice because of the unusually cold temperatures that morning. So, when I saw my trash can had blown down, I did what I normally do, I went out to pick it up, in a hurry, of course, because I don’t want to be late to work, and I found myself on my back suddenly and harshly. I felt fine at first. I got back up and actually rode my bike to work in the morning, after picking up the trash can and walking more carefully. Once at work, I felt a little discomfort in my back. Then, over the course of the day, the pain worsened. By 6th period, I had to teach from a chair. I asked my wife to pick me up instead of riding home in the screaming wind. Even in calm conditions, I think riding might have been a bad idea. My wife took me to urgent care. The doctor their diagnosed me with a strain of my latissimus dorsi muscle which is ending up to be very painful. He prescribed rest, no lifting things, and NSAID along with some heat and ice. I called in sick because sleeping was hard but moving this morning was even more difficult. In fact, this morning, around 4 a.m., I thought I could try sleeping on my side. It seemed like a good idea. But, instead, it caused the most painful and excruciating muscle spasm I have had. Luckily, my wife had a muscle relaxer and she helped me get the heating pad under me while every slight movement send waves of nine-level pain through me. I can’t classify it as ten-level pain because I just don’t know if I’ve had that yet. I think that is having-a-baby pain or gall-bladder-attack pain. But, this was still pretty bad. I don’t know but I have a feeling I may be out of commission for a few days. I can walk, carefully, but I don’t know which movements will inspire a spasm. At this point, I have no idea if I can put on or take of a shirt. Lifting the toilet seat is scary and hurts a little. Even lying down, the muscle aches. It’s a bummer. I have a lot to do at school with my students, I have a Site Rep Council meeting tomorrow, I have bike rides I want to be taking, there’s work to do in my garage, and so on. I really hate being injured. 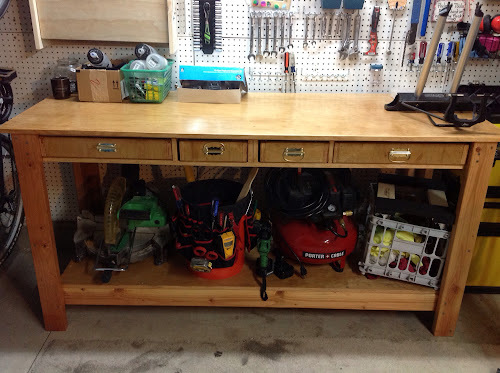 Besides that… oh, I finished my work bench. It came out pretty good. The first picture is the workspace in general. The second is a better picture of just the bench. I’m happy with it. There’s little things wrong with it, but mostly, it is great. Maybe the wood isn’t the highest quality or something but some stuff didn’t line up the way I thought it would. However, it’s a good bench and looks nice while providing a great place to work on stuff. I really like the drawers even though that added a level of difficulty and I even had to make a new drawer because one of them didn’t fit. The finish came out nice, too. In the first picture, you can see a cabinet/shelf thing I made, too. It holds all kinds of cans and bottles of stuff like wood, cleaners, WD-40, oil, grease, and so on. The door folds down to make a little shelf. It’s pretty nice and I hung in on the peg board using a French cleat. 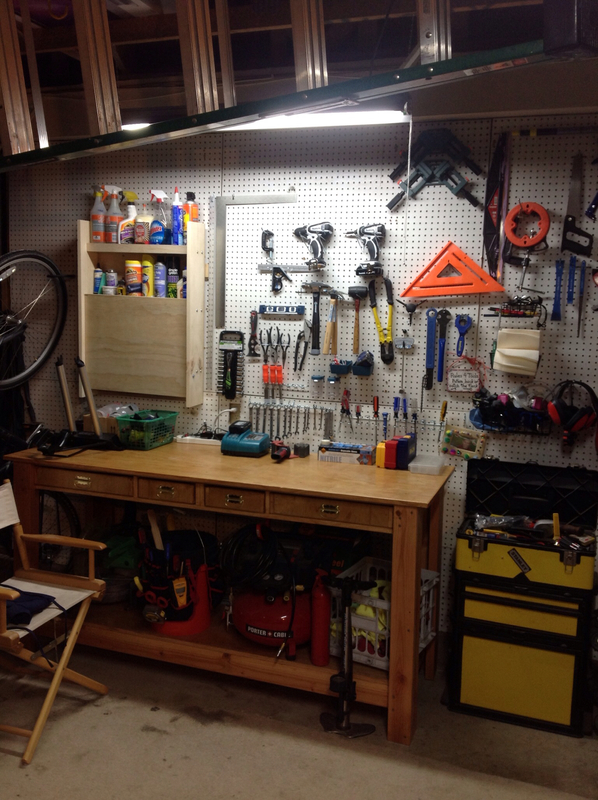 Also, I hung tools on the peg board. The peg board used to be behind several of those ClosetMaid wire shelves. I moved those to another wall and put the peg board to work holding up my tools. Much better. I really like having the tools on the wall. To me, it both looks cool but it means I am more organized and find the tools I want so much easier. So, that was a successful project. 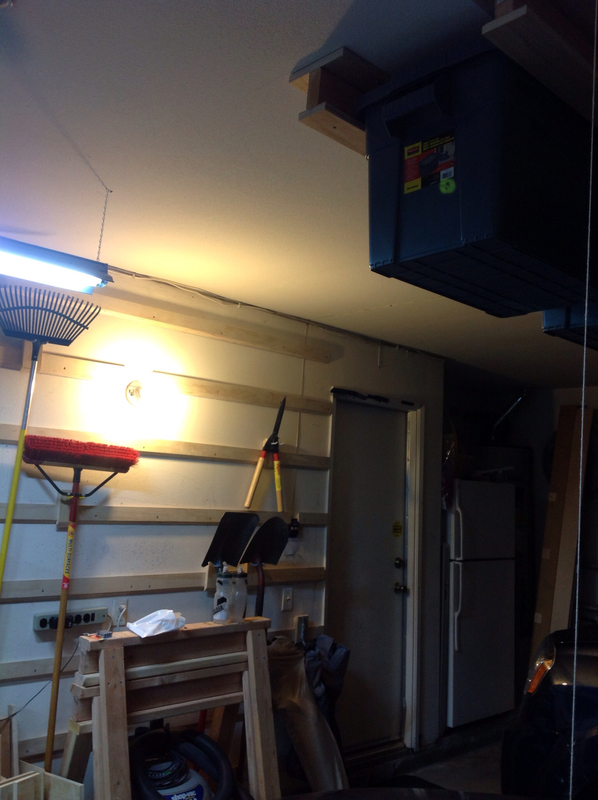 In this shot, you can see that I have attached boards to the wall for a French cleat organizing wall. I can make little cleats that hold hooks or other things to attach tools or whatever, to the wall. And, you can move the stuff around if you don’t like its placement. It’s an evolving project. And, on the right of the picture, at the top, you can see where I attached some rails to hold plastic totes for more storage. I got all of these projects from the Family Handyman magazine website. That’s how I spent most of my winter break. Since then? I’ve gotten a few bike rides in. Riding a bike in the cold is not a lot fun, unless you have something to warm it up a bit. I do, so that is okay. But, the other morning, I left to join the cycling group I belong to for the regular Saturday ride, and it had to be in the 30’s easy. The air hurt on bare skin wherever it touched. I used a “ninja mask” face cover and that helped quite a bit, actually. I was going to be riding my bike to work starting again this week, but then the back injury happened. So, it’s hard to tell how long I will be off my bike. Back injuries are not to be trifled with. At work, we are looking at poetry. I used to hate poetry, especially in high school, so I am very sympathetic when students groan at the mention of poetry, or don’t understand this whole meter thing. I don’t get it, sometimes, either. I can usually recognize iambic pentameter when I see it, but I don’t know a trochee from a spondee or a dactyl from an anapest. The Sophomores will read a little of this and a little of that. I’m a little disappointed that so many of the selections are modern and in free verse. The Juniors will look pretty closely at Emily Dickinson and Walt Whitman. Those will be fun, I like those. Aside from teaching them to analyze poetry to find the theme, symbols, imagery, figurative language, and so on, I am hoping at least to help them gain an appreciation for the form and enjoy reading some poems. Last year, I dove right into the poems and ended up finding that the kids didn’t really understand the things we were talking about, like symbols and metaphors. So, I had to teach that stuff in the middle. This time, I have opted to front-load all of that information via PowerPoint presentation. It’s not a lot of fun for the kids. But, I am able to break it up with some Think/Pair/Share activity and that helps. Of course, I’m not doing much at all if I’m at home with a screwed up back. So, next time, I am going to remember that water freezes when it’s real cold and try not to fall down in the future. Hello there. I am currently off work, experiencing exactly the same symptoms you describe (Latissimus Dorsi.) Even further coincidence I too am a teacher and feel incredibly guilty about the situation with my students. At the moment I am completely bed bound and was wondering how long it was took before you were mobile again?